Established in 1967 as a military surplus trading company, Sabiex International has since evolved and gained worldwide reputation as an expert in military tracked and wheeled vehicles, specialized in the development and upgrade of a wide range of platforms, providing turnkey solutions and complete life cycle support to its customers. The company’s core business includes: Refurbishment, overhaul & upgrade of armoured combat vehicles (Western vehicles: French AMX-13/30 and AML 60/90, American M113 and M109, German LEOPARD, GEPARD, YPR, Austrian SK105, etc. ; Eastern vehicles: T-55/T-72, BMP 1 & 2…); Supply of spare parts for armoured combat vehicles, both of western and eastern origin; Trading of armoured combat vehicles: buying from & selling to armed forces worldwide; Development of new types of armoured combat vehicles; Technology transfer, installation of maintenance & operation facilities at the customer’s premises, technical assistance & life cycle support packages; A large stock of vehicles available including: LEOPARD / GEPARD / SK105 / M113 / AIFV / M109. Life Cycle Support - Sabiex holds a large inventory of spare parts for a wide variety of vehicles (M113, M109, AIFV...) in its 30.000m² warehouses. The company however is most well known as the major supplier of spare parts for French vehicles (mainly AMX family: 10-13- 30, AML 60-90 and VAB). Engineering - A team of specialized engineers and technicians provides know how, experience and expertise required for the design, development, upgrade, retrofit and modernization of military vehicles. Such in house expertise allowed SABIEX to design its own 4x4 Light Armoured Vehicle and Tracked Heavy ICV. Modernization and upgrades address major automotive assemblies (power pack, drive and suspension systems), integration of Life Support Systems, modern and friendly environmental Fire Suppression Systems and combat systems (integration of FCS, DNVS, Laser warning systems). 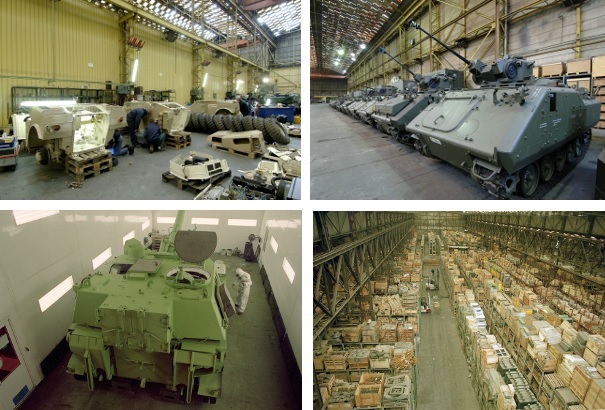 Trading & Stock - Sabiex regularly buys military vehicles and surplus goods and resell them after reconditioning in its workshops. For a long time the company has been particularly well known for supplying a large range of tracked armoured vehicles (AMX 13, M109, M113, LEOPARD ARV, GEPARD), wheeled armoured vehicles (AML 90), trucks (REO 2.5T and 5T, UNIMOG 404S) and armoured RIOT-CONTROL vehicles (BDX). Sabiex now has the similar capability on combat vehicles of eastern origin, either MBT’s (T-72), tracked or wheeled AIFV / IPC (BMP, OT-64). Depending on customer’s requests, these vehicles can undergo a complete refurbishment as well as a customer-defined upgrade before delivery.